GAZELLE, graceful elegance. Light, ethereal and very chic. 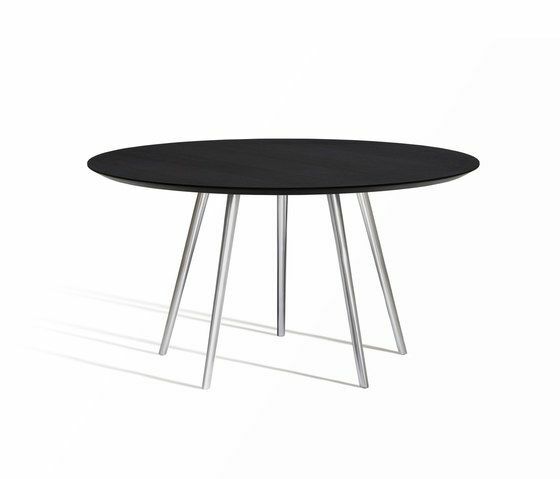 Capdell presents an important collection of tables with a pure, stylised design. The main feature of this collection is the subtle but sculptural morphology of the elegant legs that support a very thin table top. Refined elegance that removes mass and leaves the essential, suitable for any space. A digital classic The design of the legs, in anodised aluminium, is the result of digital morphing, the fluid, gradual and endless transformation of a circle and a triangle. The result is a sculptural form inspired by Italian classics like Superleggera by Gio Ponti and by the most rigorous elegance of Scandinavian wood furniture from the '50s and '60s. A real design project Gazelle’s constructive concept permits any type of shape and size table, in different measurements, shapes and materials. The legs are in anodised aluminium or epoxy varnish. There are various kinds of table tops: round, oval or rectangular in beech plywood, durmast, melamine HDF in various colours, Compac and extra clear tempered glass. The versions with top in phenolic laminated plywood and glass are also suitable for outdoor use.